Home Beers Moat Mountain Smoke House & Brewing Co. Call It A Day | Moat Mountain Smoke House & Brewing Co.
Canned 3-1-18 into Spiegelau IPA glass. Pours light haze.. light orange, nice pillowy head.. little lacing. Smell: Citrus, earthy ..floral even. Taste: As with most DIPA brews, this has a good balance of citrus, pine and floral flavors. Mild malt backbone. MF: Medium, with a robust bitterness, that doesn't interfere. Medium carbonation as well. O: A very well put together beer. Not outstanding, but worthy! No influence of the 8% ABV. Took down 2 four packs. Canned late january. The first 4 were wonderful. I puked a little after 5, passed out on the bathroom floor. Woke up with a headache, went away after I drank the last 3. I love the offseason. Pours out a hazy yellow hued golden color with some orange highlights. 3" tower of white foam is thick, bubbly and creamy. The hop is very bold and filled with various, dense hop aroma's. Low level citrus and pine, more earthy and grains. A very fresh hop smell, freshly picked and crushed up style. Peppery and earthy with an array of citrus based fruits. Very bold. The flavor is simply awesome! Nothing simple though....deep, complex hop flavors: Earthy grains and dried wheat, peppery, herbal bite with pine and citrus fruits. I'm partial to the "wet" hop flavors, this one tastes as though the hops were just picked! Bold earthy, dry leafy notes is a favorite aspect. Juicy feel and flavor but also dry and earthy. A nice duel between East and West coast style. The malt is a light golden effect, slightly sweet but very crisp and balanced just enough to allow the hops to have maximum impact. The mouthfeel is light to medium bodied with a lush, slightly juicy effect that has a nice, dry and only slightly bitter finish. I have been having many incredible East and West coast style DIPA's ....and this one stands out even among some very heady compitition. High grade stuff, excellent hop righteousness. 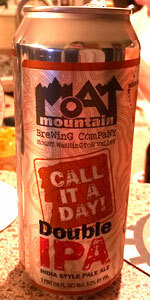 Call It A Day from Moat Mountain Smoke House & Brewing Co.